Throughout history, knots and cordage have been important in every day life, in fact Archaeologists have found evidence that Neolithic man used a variety of knots in bow making, fishing and hunting. As you would expect, the majority of knots have their beginnings in the sea faring world and are still widely used today, whilst knots and lashings in everyday life have been replaced by such things as plastic ties and sticky tape.
" Its time to revive those skills we gained during our years as cubs, scouts, brownies and guides"
Your session will start with a short ice breaker, where your group have to work out the solution to a knotted challenge. 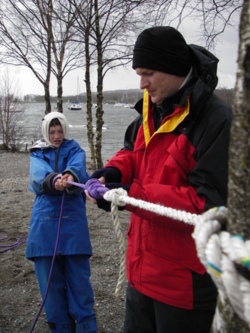 Each individual will receive a length of practice rope and working in pairs will be guided by an instructor through the basics of knot and hitch tying. You will be shown a wide variety of knots including overhand knots, the figure of eight, the bowline, the reef knot and the clove hitch to name just a few. For the remainder of the morning your trainer will discuss the pros and cons of various knots and their uses. 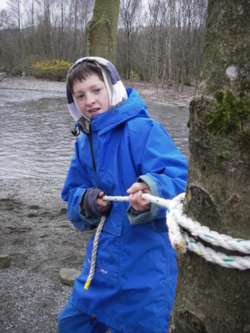 After learning the basics of knots and lashings in the morning we will break for lunch and then in the afternoon your team will meet to discuss and draw up plans to build a raft or pontoon bridge. Many people have the impression that knots and knot tying is a little less than exciting, its quite the opposite, knot tying is a challenging outdoor activity that will test your patience and it will also come in useful in many areas of life! Give it a go!